All inkjet printers have collection areas for wasted ink used during nozzle checks and/or cleanings. The MC-30 Maintenance Cartridge is a replacement for the one included with the Canon imagePROGRAFF PRO-2000, 4000, 4000S, and 6000S professional wide format inkjet printers. In case of cautions or issues concerning the maintenance cartridge, an error message will appear on the LCD screen. Take appropriate action as prompted by the message. If the displayed message indicates that the maintenance cartridge is nearly full, promptly obtain a spare. 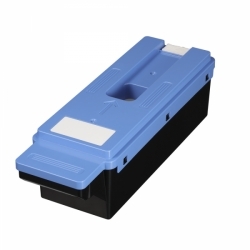 When the maintenance cartridge becomes full, the printer stops working until it is replaced.